The Ellon Cinema team will be screening their last film before their Summer break this coming Friday. Solo: A Star Wars Story (12A) ‘An action packed and fast paced addition to the Star Wars family of films with a surprisingly engaging story’. 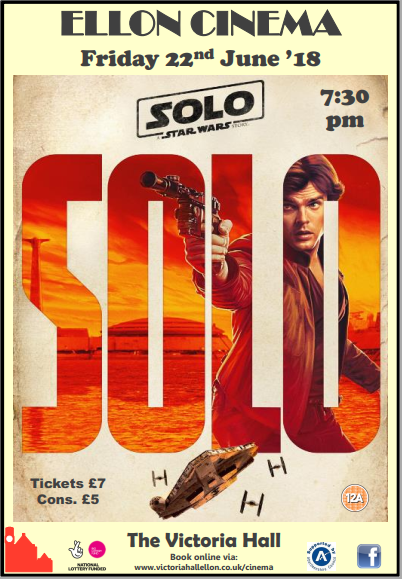 With the emerging demand of hyperfuel and other resources, Han Solo finds himself in the middle of a heist alongside other criminals, where they meet the likes of Chewbacca and Lando Calrissian in an adventurous situation exposing the criminal underworld of the Star Wars saga. The team will be returning on 26th August for another Cinema Sunday with another two fabulous films for all tp enjoy: ‘The Incredibles 2’ at 3 pm and ‘Mamma Mia Here We Go Again’ at 6 pm.